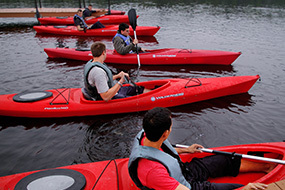 Our intermediate courses are aimed at people who are looking to progress their paddlesport skills further. We run British Canoing 2 Star courses for you to take your 1 Star to the next level and also learn a new craft. We also do flatwater racing courses for people interested in marathon racing and can also help paddlers find local foundation safety and rescue courses to build on 2 Star skills and prep for possible coaching achievements. This is an ‘improvers’ course that naturally follows from the 1 star award. It is intended for improvement and development. As such it is ‘multi-disciplinary’ and you will be cover both kayak and canoe skills. Find out more. At the BCCC, we do not run Foundation Safety & Rescue Training (FSRT) courses. However, we can partner up with other clubs or advise members of any FSRT courses being run by British Canoeing. Find out more.